Do you have your own construction company and are you regularly working on construction sites where there is no power available? Or are you looking for a simple generator for your boat or camper? In this webshop you will find a complete range of power generators. These powerful generators generate power through a combustion engine, so you can connect your equipment anywhere. Different types of aggregates can be distinguished. On this page you will find three types: gasoline units, diesel generators and inverters. They all use a combustion engine to generate electricity, but the difference is in the type of fuel they use. A petrol generator works on petrol, a diesel generator uses diesel. In general, diesel generators are more reliable in use than petrol aggregates. On the other hand, they are usually heavier and make more noise. An aggregate on diesel is most commonly used for professional applications, such as construction and industry. Literally, inverter means 'inverter' or 'inverter'. With an aggregate with inverter not only the voltage is converted, but also the frequency. Normally the motor in an aggregate can never produce the same energy all the time, causing fluctuations. The inverter technology ensures that the generated energy is converted into stable energy, without fluctuations. This makes it possible to connect sensitive equipment such as laptops, computers and televisions. This makes an inverter aggregate ideal for use on the campsite or on a boat, for example. Whisper aggregate: usually this is an inverter aggregate. This compact generator delivers up to 1000 watts of current and is quiet and economical in use. Gasoline generator (230 volts): the capacity of these generators is usually somewhere between 1000 and 6000 watts. Gasoline generator (230 volt / 400 volt): an aggregate with a power connection for heavier equipment. Diesel generator (230 volts / 400 volts): there are diesel generators with and without a power current connection. The power is usually between 3000 and 6000 watts. Diesel fuel aggregate: a diesel generator in a closed housing, which has a low noise level, just like the whisper units on petrol. An important property to take into account when purchasing an aggregate is the term. This is the period that the generator can run on a full tank. For example, if you need electricity for a whole working day, it is advisable to opt for a model with the longest possible running time. The running hours range from about 3 hours for a compact inverter unit up to 9 hours for a powerful petrol generator. A generator can be equipped with different connections. For example, by far the most aggregates have a standard connection with an output of 230 volts. You can connect a reel, extension cable or electrical device. In addition, there are extra powerful generators, which have a connection for 400 volts of current. These are specially made for extra heavy equipment, which only works on power current. 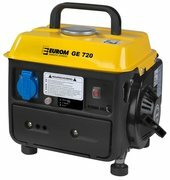 There are also generators with a 12 volt connection, which you can use for example to connect a cool box. The power is displayed for each connection to the unit. Because the motor never runs at the same speed constantly, there are fluctuations in the current. That is why a continuous and maximum power is shown. The continuous power is the 'average' power, which is what the generator can deliver in any case. The maximum power is that what the aggregate can generate in a peak moment. With all power generators in our range, the noise level is indicated. The unit dB (A) is used for this. This is used in the vast majority of cases to show the strength of the sound. The unit is derived from the normal decibel, but corrects the volume for the sensitivity of the human ear. The noise level displayed on the unit is measured at a distance of 7 meters. In general, an inverter unit works quieter than a gasoline or diesel generator. An inverter is therefore also called a whisper aggregate. Most electrical appliances require a little more power from the power source (the mains or aggregate) during startup than during normal use. This is called peak current collection. For the mains, this decrease is usually not a problem, but with an aggregate there is a risk that it will exceed the continuous power and perhaps even the maximum power. The latter will lead to problems: the unit is 'too light' to start the device, although the generator could operate the device perfectly once it was switched on.